Sleep, and its disorders, have long been the Rodney Dangerfield of Medicine and Public Health—they just don’t get any respect. Perhaps this is because sleep advocates have lumped all “sleep disorders” together in describing their risks. Clinicians and the public at large have been justifiably skeptical that “sleep disorders,” which could be anything from tooth grinding to head banging to nocturnal eating, are dangerous. Sleep & Safety, by focusing primarily on sleep deprivation, circadian rhythm asynchronies, and sleep-disordered breathing, focuses on the data and avoids hype and speculation. And the data is scare us indeed. This terse, well-written e-book first lays the physiologic groundwork for the effects of sleep deprivation, shift work, and sleep-disordered breathing and then critically reviews the data about their adverse effects. An important element of this electronic volume is its emphasis not only on the risks to the afflicted individual, but also to those on the road, in the plane, in the ranks, or under the knife with him or her. 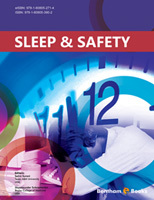 Sleep & Safety brings home the message that sleep loss, sleep apnea, and shift work are public health issues. In the late 1800s, an industrialist and industrialized nation realized the benefits of shift work. The invention of the light bulb in 1879 by Thomas Edison increased the capacity of human beings to work around the clock, henceforth defying the body’s circadian rhythm. Shift work was thought to be an excellent way to increase production and meet consumers’ demands, and nowhere else was this more apparent than in the manufacturing and steel industries, as well as several other industries in which machines were capable of functioning 24 hours a day. Running such expensive machinery all day and night led to the rise of essential satellite services such as law enforcement and health care, while the use of fire fighters led to the development of shift work and the associated side effects of sleep deprivation and fatigue. This, in turn, eventually resulted in an increase in both errors and accidents, and the same trend continues today as military and aviation personnel are exposed to more stressors due to an increase in transatlantic flights, several wars, and everincreasing requirements for constant surveillance. In this e-book, we discuss the normal circadian rhythm physiology and the pathophysiology of sleep deprivation. We also investigate the consequences of sleep deprivation and shift work on health, the military, aviation personnel, and the elderly, as well as safety among drivers and members of the military. We also address sleep issues and safety laws pertaining to military and aviation pilots. Finally, we discuss the legislative issues we already have and those that need to be undertaken in order to make our society safer. This is one of the very few books that has brought up these sensitive issues our society is facing. We hope the readers will enjoy and benefit from it and that it will help make our society safer.